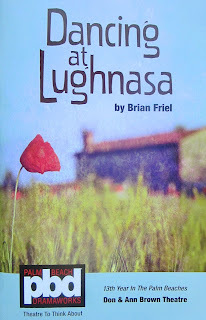 It has been an extraordinary season at Dramaworks and as the personable Resident Director of the company, J. Barry Lewis, said at the "Knowledge and Nibbles" session before last night's preview performance of Brian Friel's best known play (he's written 36!) 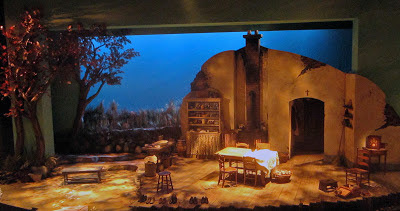 Dancing at Lughnasa, they wanted to end the season with an explanation point. The season began with Talley's Folly, a sensitive, delicate two person play about injured lives and it concludes with this eight person production, with much of the focus on five unmarried sisters, but still about injured lives, an ensemble production narrated by Michael, the adult child of two of the play's characters, Chris and Gerry (although we never see Michael as a child on the stage). As a "memory play" we spend time in the past to understand the present. And as an ensemble, there is no real central character, but that of the family unit and how these people come together and relate to each other in their own special ways. The overriding themes are dreams foregone, and the old world coming into conflict with new world values, such as the Catholic church losing its grip in the face of rising secular activities, like music and dancing. The production is a veritable time machine trip, all layers of the play bringing you to the village of Ballybeg, Country Donegal, Ireland in 1936. The play also carries forth a recurring theme in Irish theater, suffering, tragic women, and men who are free to drift in and out of their lives. I think of Martin McDonagh's The Beauty Queen of Leenane (performed by Dramaworks last season) and some of the works of Sean O'Casey which explored similar themes. Gerry, Michael's father, visits once a year, with dreams of being a great gramophone salesman, or an adventurer in the Spanish Civil war. The Uncle, Father Jack, has returned from Uganda where he was a missionary but has returned ill, and has been transformed into a pagan worshiper, very much in conflict with the values of his sister, Kate, who, of the five sisters, still staunchly upholds Catholic traditions. The women are the ones who keep the family going, do the work and have to carry on in the face of adversity, the changing times of the industrial revolution that threaten their meager income (Kate is a school teacher whose income is supplemented by two of her sister's -- Rose and Agnes -- work as piecemeal knitters). Theirs are dreams constantly deferred but Friel introduces the interesting conceit of an unpredictable wireless radio, one that will occasionally work, and it is then the women can burst into dance, from which the play derives its title after an Irish pagan dance festival. They dance fast and furiously and passionately, with one another and singularly, a sudden, powerful geyser of normally suppressed sexuality and freedom, with animal like cries of joy, but as strangely as this music comes into their lives it fades away and it is back to their mundane lives. The "magic" of the radio -- clearly remembered by Michael with the nickname of Marconi -- opened the outside world to this family for the first time. 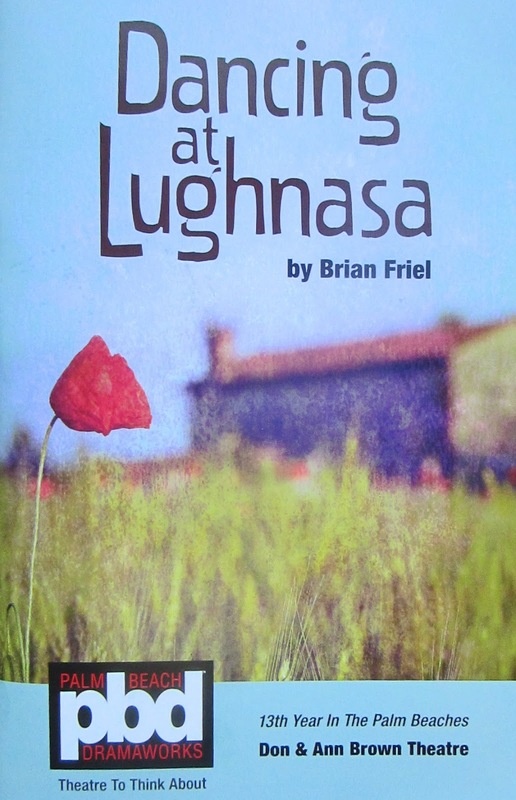 Friel uses the stage as a canvas to paint an abstract of family dynamics of the times, ones that mirrored his own life and clearly this is why the play works. Michael is the playwright's voice: "atmosphere is more real than incident." And in order for it to work, the setting must also be perfect and the scenic design by Jeff Modereger has created a startlingly stark depiction of the family's threadbare home and its outside yard, using the full expanse of the stage and compensating for the stage's lack of depth. It is a stage the actors can move freely about without opening and closing doors. The challenge to the actors who play the sisters is to capture the specific individuality of the different sister relationships. As an ensemble production, the audience needs to get to know each character on his/her own merits, and follow that person's own solitary story. Kate is the default mother of the family, a schoolteacher and as such the main provider. She is also the upholder of tradition and the values of the Catholic Church (although she, too succumbs to some dancing, but not with wild abandonment). Julie Rowe, who is new to Dramaworks, but not South Florida, plays the role with stoic determination. She, as are all of the sisters, is protective of Rose, played by Erin Joy Schmidt. Rose is a little slow witted, innocent, and is the first to get caught up in the excitement and dreams of attending the upcoming harvest dance (which they don't). Ms. Schmidt -- who co starred in Talley's Folly at the beginning of the season, carries the role with a kind of gullibility and she, of all the sisters, is most transparent to the damage they all feel. A veteran Dramaworks actor, Margery Lowe, plays Agnes, who takes a special interest in protecting Rose. The two of them knit to supplement Kate's income and they are the ones who become most vulnerable when a factory opens nearby. This is a difficult role, well acted by Ms. Lowe, as Agnes in many ways is the most repressed of the sisters, secretly in love with Chris' Gerry, but never able to reveal anything. Chris is played by Gretchen Porro, a Dramaworks newcomer who, when with Gerry, becomes almost manic, a schoolgirl in love, and without him, depressive, a "bad woman" as she has an illegitimate child (but, nonetheless, a love child as the pagan convert Father Jack refers to him). It is another difficult role to play (there are really no easy ones) and we hope to see Ms. Porro in another production. Meghan Moroney plays Maggie, the homemaker and in many ways comes closest to a central figure as a fun loving family go between, played with indomitable optimism and energy by Ms. Moroney. But her good nature is belied by regret too, occasionally singing with a beautiful voice or humming the then popular song, Isle of Capri. She is a powerful figure on stage and as Irish as a shamrock! And Michael's father, Gerry (played by Dramaworks veteran Cliff Burgess), who occasionally visits to see his son, re-romance his would-be-wife, Chris, with a wink at Chris' sister, Agnes, is not immune to the power of the music, cutting a Fred Astaire with both Chris and Agnes at times to the refrains of Dancing in the Dark. Burgess walks a line in this role, always erring on the side of likeability. You never feel he is a heel in spite of his dreams of adventure, and his kaleidoscopic, self-servicing visits. He embodies the freedom the women pursue, living in the moment. Our matriarchal Kate worries when her brother, Father Jack, played by Dramaworks veteran John Leonard Thompson, returns from his missionary work in Uganda, as he not only comes back sickly, with memory loss from malaria, but as an admirer of pagan practices of the African people, threatening the Mundy family's reputation -- and putting her Catholic values in direct conflict. Thompson glides around the stage like a gray ghost, dazed most of the time, but slowly getting it together, near the end trading his symbolic British colonial hat for Gerry's straw hat, before, Gerry, himself, sets out to find adventure in the Spanish-American war. The play opens and closes with two powerful, wonderfully written monologues delivered by the adult son, Michael, who is sifting through his memory to describe his childhood recollections. If I dared, I'd repeat those here as they are just so beautiful, delivered with the devotion of a loving son of this decimated family, by Declan Mooney, another Dramaworks veteran. But to reprint those (they can be found on the Web) is to reveal just too much of the outcomes of these damaged characters. In fact, there is a pervading sadness emitted by the play. We too briefly get caught up in the spontaneous dancing as a relief from the ennui of despair. And the play seems long, although Dramaworks' pacing felt right; nonetheless there is just so, so much material to cover. J Barry Lewis' direction was flawless, but, a two hour and thirty plus minute play (with a 15 minute intermission) is a challenge to keep the audience engaged when the plot is partially made up of vignettes of despondency. All in all, a satisfying conclusion to Dramaworks' 2012-13 season.